Download this free sample excerpt from the 2018 Pet Groomer’s Appointment Book & Marketing Planner. Includes the March 2018 Grooming Business Success Planner that outlines the month's promotions. 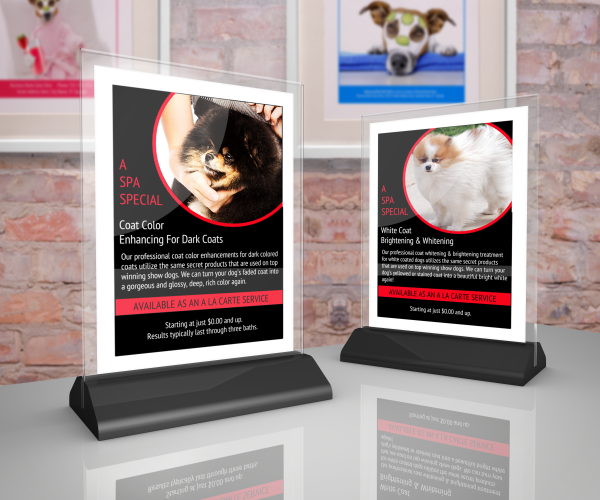 Plus, some of March's Printable Promo Pieces to use in your pet grooming salon. This month's printables includes two Facebook signs & directions on how to use them to get massive FREE advertising for your grooming salon! This free offer is available until 3/3/18. (We hate spam as much as you do, so we never share your information with any other entities. By entering your email address, you will immediately be taken to the free download page and you will also receive notice of future free downloads each month. You can unsubscribe at any time if you decide that you no longer wish to receive future freebies) Free offer available until 3/3/18. Every time a customer “checks-in” to your business Facebook page, that check-in automatically gets blasted out to all of that person’s Facebook friends. Those friends will then see that their friend comes to your grooming salon. That's instant credibility and word of mouth advertising...all for free! 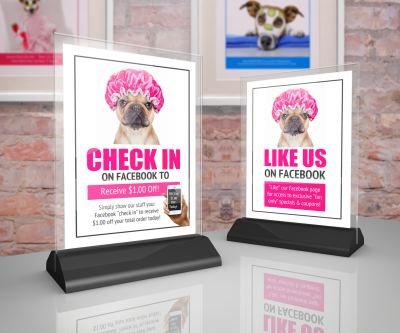 Get more "check-ins" by displaying this month's printable signs. This month's profit program is for promoting coat whitening & coat color enhancing add-on services - Your salon may already offer this, but if not, you can easily do it by having coat color enhancing shampoos on hand and coat whitening & brightening formulas. You can find them through Cherrybrook or even Amazon here. A tiny bit goes a long way so this is a very profitable add-on. 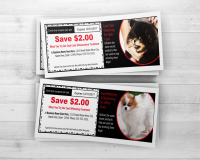 Both editions of our Groomer’s Profit Kit include two printable 5x7 sales signs to promote this add-on service, as well as printable coupons to give to customers to entice them to try it next time. We also recommend that you promote this service by listing it on your grooming services menu AND post “Before & After” photos of this to Facebook & Pinterest, for even more success (templates for both of those are included in our advanced kit). Pet Report Cards provide that added personal touch that puts a smile on client’s faces. It’s personal touches like this that help to keep customers loyal to you. They also work as an excellent communication tool to inform clients if their pet has any noticeable health issues as well. Report cards also double as a sales tool that can be used for other promotions throughout the year. Several editable report card template designs are included with our advanced kit, and a free one is available on our website here.